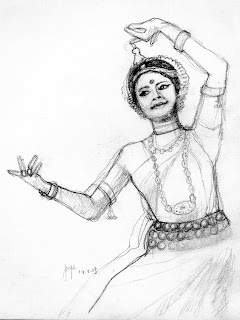 Recently as dance and spirituality have formed a wonderful connect in my mind, I also discovered the amazing understanding of a Guru from both these perspectives. All the ideas of a guru being like a teacher, mentor, guide seem limited in their dimensions. I think that the guru is the bridge from the mortal world to the divine, even the means to go in free flight into the cosmic world within. Suddenly one finds such love, joy and blessings and a feeling of ever expansiveness, I think this must be how people feel skydiving accompanied by the stillness of the world outside and within. A wonderful classical dance class or daily meditation leaves one with such heightened awareness. Suddenly one finds leaves greener, the traffic sounds like a symphony and joy welling up in the cup of one's heart. Is it joy, or gladness or contentment, a feeling difficult to define in english terms? I think it is 'anand' the hindi term for a kind of lasting forever feeling of bliss. Amazing Gurus are those who take us skydiving when we are walking on the road, plunging into the ocean of our depths and opening up forever the room of our being to a gorgeous view. From this room with a view we start looking at things afresh and feel wonderfully drenched in the sunshine or raindrops that come our way. To even say Thank you for these experiences feels small, it is as if me and my Guru were designed for each other. For a journey much beyond soulmates.